Part of the summer line up of 4x4 tyres from Dunlop, the Grandtrek AT3 provides a high level of performance and handling in all conditions. The Dunlop Grandtrek AT3 also has relatively low noise emissions compared too it's peers and as such is useful for those planning on doing the miles on the motorway in their 4x4. 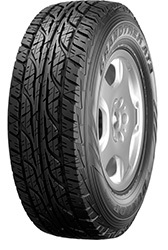 In internal testing from Dunlop the Grandtrek AT3 scores near perfect in off road handling. The tyre also incorporates a flatter tread design to ensure longer life through even wearing of the tyre.